The lease on Ralph Wilson Stadium was set to expire in July, and, while team owner and president Ralph Wilson has long said that the Bills wouldn't move while he was alive, Ralph Wilson is 94, and the Bills seemed to be inching further away from Buffalo every season. "Home" games in Toronto's Rogers Centre every season and rumors about a move to Los Angeles to fill their new downtown football stadium made it seem like some higher-ups weren't particularly attached to the franchise's current location, and a disproportionate number of letters from Bills fans protesting blackout rules suggested that a frigid winter day in Ralph Wilson stadium to see a crappy Bills team wasn't the draw it once was. As passionate as Bills fans are, the Buffalo location didn't seem well-suited to the realities of the modern TV market and game day experience. It's a $271 million deal, of which $130 million will be committed to upgrading an aging stadium that opened in 1973. And the agreement includes a commitment to put aside funds and establish an advisory group to explore the potential of building a new stadium for the franchise. 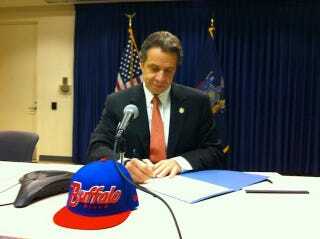 Just as important, the agreement includes a provision that essentially locks the Bills in for the next seven seasons. The franchise would have to pay $400 million if it decides to leave before 2020. The team then has the option of buying out the remaining three years of the lease for $28 million. "This is an investment that the state is making. It's an investment in the Bills. It's an investment in western New York. And I'm proud to make that investment," Gov. Andrew Cuomo said, speaking via a satellite television hookup from New York City because stormy weather prevented him from flying upstate. In a breakdown of costs provided by officials, state and county taxpayers are on the hook for $226.8 million for the duration of the lease. That includes a series of annual payments for annual capital and game-day expenses. Of that total, the state and county are committed to making a one-time payment of $94.5 million next year for stadium upgrades, which will include getting new scoreboards, widening concourses and building a new plaza. The Bills' share for those upgrades will be $35.455 million. "Those that would criticize the state and Erie County for investing taxpayer money to keep the Bills here would be the same ones criticizing if the Bills left," Lt. Gov. Robert Duffy said. "If we were to lose them, that would be a shot into the morale of this community and this state that could not be understated." The Associated Press goes on to note that there are "fears" about the "long-term stability of a team in the United States' 56th largest television market, and in a Rust Belt region," and that Ralph Wilson's "health is slipping," and that no one has seen Ralph Wilson since August, and that the team's CEO deflected questions about what will happen with the team after Wilson's death (when he's reportedly encouraged his heirs to sell the Bills). The CEO also did not answer questions about how exactly this will improve the morale of Western New Yorkers when they're on the hook to pay more in annual taxes (about $226 million over 10 years) than the team gives back to the state (about $20 million annually), and fans may well find themselves watching the franchise play out the Buffalo string very shortly into this 10-year lease (which has a small buy-out after seven years). But other than that, this is a proud day for the community.